In this special set you get the following 3 coins: 1. 1964 Genuine Silver Kennedy Half Dollar - 1964 was the first year of Issue and these coins are made out of 90% Silver. (the cost of this coin alone in Silver is $10+) 2. 2010 24K Gold Plated Kennedy Half Dollar -this is the 50th Anniversary Election Coin. 3. 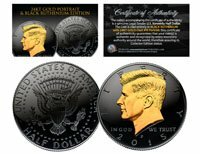 2011 Colorized Kennedy Half Dollar - this is the 50th Anniversary Inauguration Coin. Here is your chance to own an OFFICIAL beautifully colorized JFK Kennedy Half Dollar U.S. Coin. This official high-quality genuine Legal Tender United States Coin has been colorized using a unique multicolor authentic process. Colorizing coins involves the unique application of special inks directly to the surface of a coin using a unique and painstakingly multicolor coin process that achieves a level of detail, color saturation, and durability that is #1 in the industry. The result is an everlasting colorized coin collectible of ultra-high quality. Coins come displayed on a die-cut display with beautiful artwork sealed in a 4” x 6” acrylic airtight case.